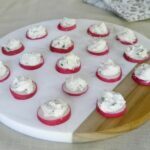 These low carb creamy anchovy canapés have sliced radish as the base. Great for entertaining! 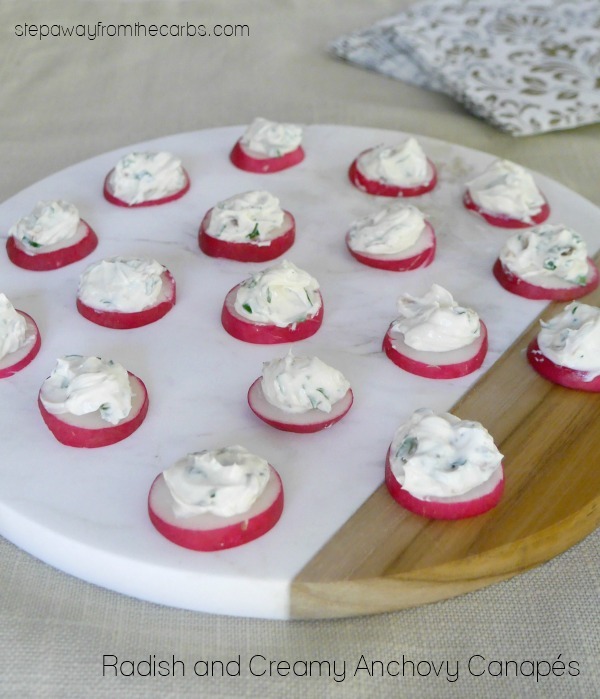 These canapés add a bright pop of color to any party – thanks to the radishes! 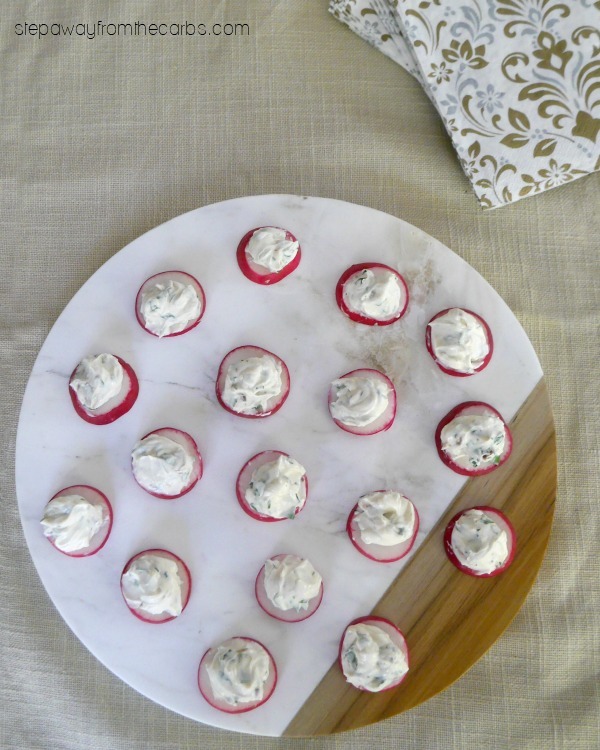 They are topped with a wonderful mixture of anchovies and cream cheese that pairs fantastically with the slight pepperiness of the radishes. 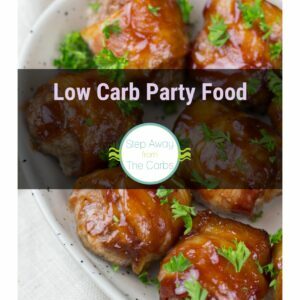 They are super low in carbohydrates, so if you’re planning any events and need to provide food – make sure you include these tasty little bites! To make the creamy anchovy topping, mix together cream cheese, finely chopped canned anchovies, chopped flat leaf parsley, lemon juice and salt and pepper. Prepare the radishes by cutting them into slices, discarding the top and tail. 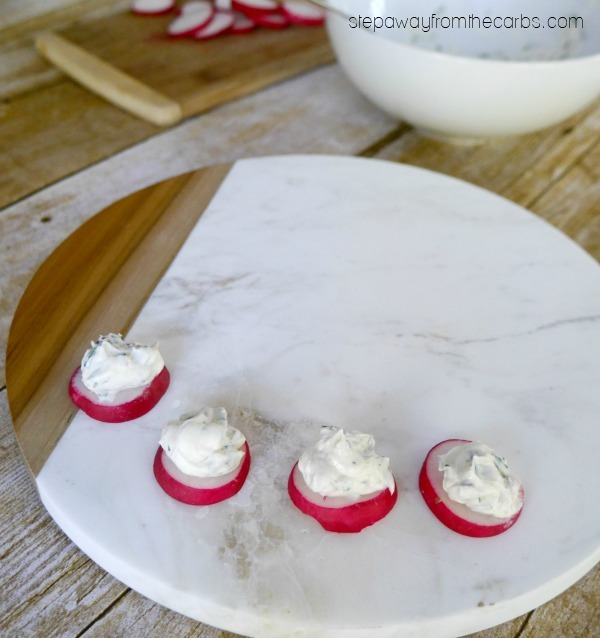 Assemble the canapés on a serving board ( I *love* this one from Anolon made from marble and teak – get it from PotsAndPans.com or Amazon!). Just spoon a little of the anchovy mixture onto each slice of radish, and arrange them on the board. This recipe makes about 18 canapés, and serves 6 as part of a canapé selection. The topping can be made in advance, but they should be assembled just before serving. To make the creamy anchovy topping, mix together the cream cheese, anchovies, parsley, lemon juice, salt and pepper. Prepare the radishes by cutting them into slices, discarding the top and tail. Spoon a small amount of the topping onto each slice of radish and place them on a serving board. The recipe makes about 18 canapés.